Miami’s finest gathered for Informed Families/The Florida Family Partnership’s 33rd Annual Dinner At Joe’s, showing their support for preventing drug problems before they start. The illustrious event, held on Monday, May 14, was chaired by Joe Natoli of Baptist Health South Florida. Close to $250,000 was raised to support Informed Families’ statewide prevention programs and initiatives designed to help kids grow up safe, healthy and drug free. 400 guests attended the dinner, which was complete with local celebrity sightings, a pre-dinner Street Party and of course Joe’s signature stone crabs, coleslaw, hash browns, key lime pie and legendary service. Several attendees who haven’t missed a Joe’s dinner were recognized with a special pin to commemorate their commitment to Informed Families and helping kids grow up safe, healthy and drug free. Some notable event attendees include: Betty Chapman and Dale Chapman Webb, Alfred & Pam Giganti Bunge, Penny Shaffer, Nancy & Jon Batchelor, Dorothy & Aaron Podhurst, Susan & Jim Carr, Judge Norma & Eugene Lindsey, Ginger Mead, Susan & Robin Shelley, Al Cardenas, State Attorney Katherine Fernandez-Rundle, Senator Anitere Flores and State Representative Nick Duran. 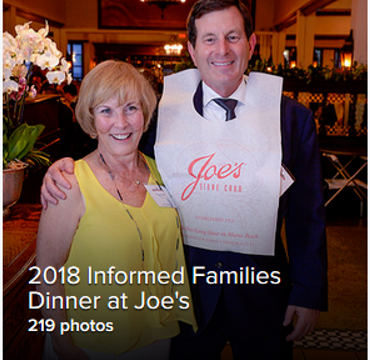 Raising in excess of $200,000 to support Informed Families' programs to help kids grow up safe, healthy and drug free across Florida, the 32nd Annual Informed Families Dinner at Joe's Stone Crab Restaurant was a tremendous success. Long-time supporters and event co-chairs Pam Giganti-Bunge & Alfred Bunge and Dr. Linda Neider & Dr. Paul Sugrue pulled out all the stops to make the dinner the best yet. This year’s theme was "Communities that Care," reflecting the importance and power of communities in working together to stop the spread of drug use, especially the devastating current opioid epidemic. Aside from Informed Families, the big winner of the night was dedicated supporter Sara Herald, who won the raffle for dinner for 20 guests at Joe's Stone Crab Restaurant. Guests enjoyed a wonderful street party prior to enjoying Joe's delicious stone crabs among old friends. Informed Families has partnered with Joe’s Stone Crab Restaurant for over three decades to help keep children in South Florida and beyond safe, healthy and drug free. Many of the annual event attendees have regularly attended since the first dinner in 1985. The 32nd Annual Informed Families Dinner at Joe's Stone Crab Restaurant will take place on Monday, May 15, 2017. The Joe's dinner will raise funds to support Informed Families' prevention programs and initiatives across Florida, which are designed to help kids grow up safe, healthy and drug free. 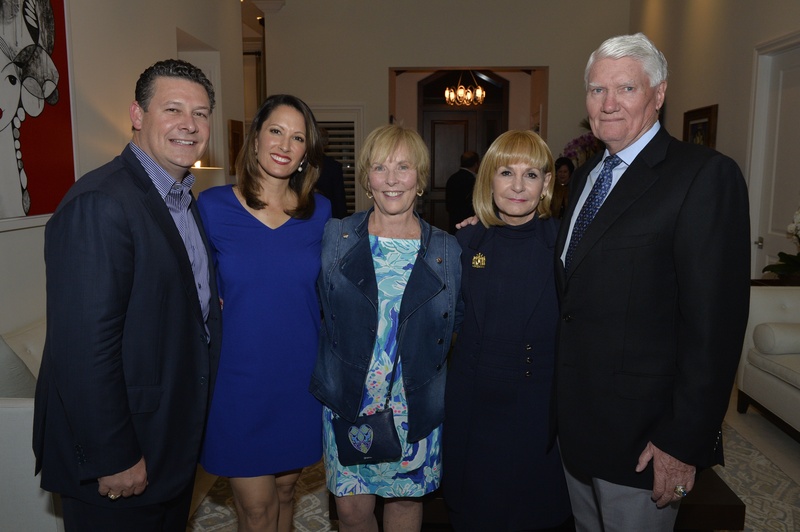 On March 16, event co-chairs Pam Gigante-Bunge & Alfred Bunge generously opened up their beautiful Pinecrest home to sponsors, board members and friends of Informed Families to preview plans for the fabulous upcoming 32nd Annual Dinner at Joe's Stone Crab Restaurant, which will be held on May 15th. The Bunges, along with fellow event co-chairs, Linda Neider & Paul Sugrue, gathered with and thanked sponsors and special guests, while sharing exciting details about the much-anticipated event. According to a 2017 article in The New York Times, “Public health officials have called the current opioid epidemic the worst drug crisis in American history, killing more than 33,000 people in 2015. Overdose deaths were nearly equal to the number of deaths from car crashes. In 2015, for the first time, deaths from heroin alone surpassed gun homicides. The Joe's event helps Informed Families reach over 3.2 million children and their families across Florida. Besides, who can resist sharing a dinner of Joe's Stone Crabs with family and friends - without the wait? The annual Informed Families Dinner at Joe’s is an event with no boring speeches; just good friends and families who want to help kids grow up safe, healthy and drug free! The Informed Families dinner at Joe’s brings out Miami’s best families. Will you be part of the festivities? For more information, please contact Esther Davila Edavila@Informedfamilies.org or 305-856-4886. View sponsorship information. Pam Giganti-Bunge is an Emmy Award-winning journalist and veteran news anchor who has worked in the radio and television industry for the last 26 years. She is currently the host of public affairs program, Your South Florida, on South Florida PBS. She is also an adjunct professor at the University of Miami’s School of Communication. For nearly 15 years, she led WTVJ NBC 6’s morning team as anchor of South Florida Today. Giganti-Bunge has covered presidents and leaders, soldiers in wartime, and devoted countless hours to breaking news including hurricanes. In 2009, she won an Emmy for her health special, “Breast Cancer: Interactive.” She has been recognized with an NBC Certificate of Excellence and an Ovation Award for Outstanding Teamwork. Giganti-Bunge has supported several charitable organizations in addition to Informed Families. She is a former board member of the Suncoast Chapter of the National Academy of Television Arts and Sciences and has mentored at-risk high school girls through Women of Tomorrow. 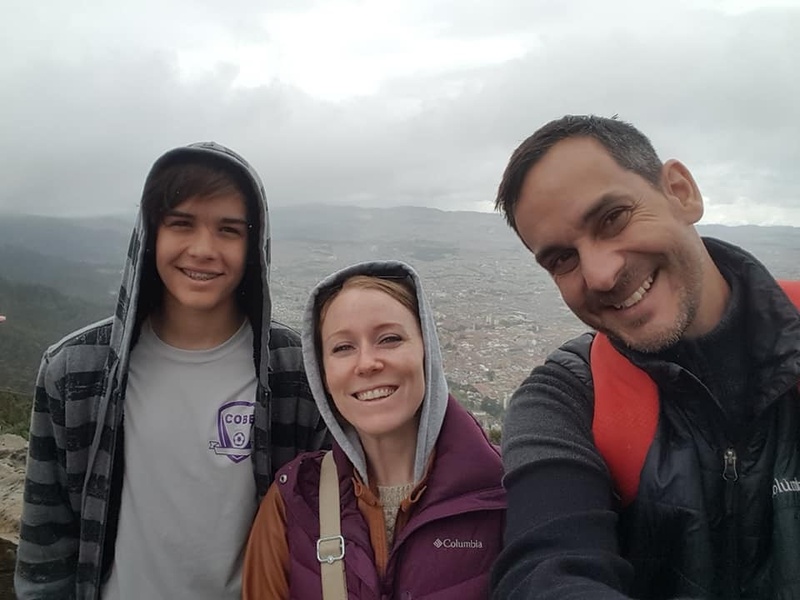 Pam and her husband Alfred Bunge are the proud parents of three daughters. Alfred Bunge is a Managing Director and Banker at the J.P. Morgan Private Bank. He leads an integrated team of specialists that advises ultra-high net worth clients throughout South Florida and Puerto Rico; delivering an array of customized financial planning, investment management and fiduciary services, among others. Prior to joining J.P. Morgan, Bunge was a Principal at Bernstein Global Wealth Management where he led and mentored a team of financial advisors and associates to deliver financial strategies to high net worth clients and their professional advisors in South Florida and Latin America. Before entering the financial services industry, Bunge served as regional manager for the Latin America Management Team of Fortune 100 company, Johnson Controls, Inc. A commissioned officer of the U.S. Navy, Bunge graduated from the U.S. Naval Academy with a BS in Economics and Political Science, and serves as Vice President of the United States Naval Academy Alumni Association – Miami Chapter. He earned an MBA from the University of Miami where he has remained active and is Past-President of the Citizens Board and former Member of the UM Board of Trustees. Bunge is a member of the Orange Bowl Committee and Advisory Board member of Mission United, the United Way of Miami’s veteran support organization. Dr. Linda Neider serves many roles at the University of Miami, where she has won dozens of awards teaching undergraduate, MBA and executive classes in leadership, organizational behavior and human capital (resource) management. She is Director of the Master of Science program in Management, Leadership specialization and Professor in the Department of Management and the Department of Health Sector Management and Policy plus the Program Coordinator, Human Capital Curriculum, Global MBA Program for the Americas. Neider is also former Vice Dean at UM for Internal University Relations, Global/Cross- Disciplinary Initiatives and Undergraduate Programs. She co-edits the book series, Research in Management, which recently published Ethical Leadership (volume 10) and Transforming Organizations (volume 11). In addition to her commitment to UM, Neider serves on the Board of Directors for the Humane Society of Greater Miami, the Board of Governors for the Young Patronesses of the Opera and the Board of the Cotillion Club of Greater Miami. Neider has an M.A., an M.B.A. and a Ph.D. from the State University of New York at Buffalo. Dr. Paul Sugrue is a proud veteran and graduate of the U.S. Naval Academy. He is the former Dean of the School of Business at the University of Miami and Professor of Management Science. As Dean from 1992-2007, Sugrue doubled the square footage of the School of Business by raising money to fully fund the construction of seven major capital projects: DelaCruz Study Center, Ziff Graduate Placement Center, Storer Auditorium, McLamore Executive Education Center, Aresty Graduate School Building, Kosar/Epstein Faculty Office Building and the Newman Information Resource Center. During his tenure as Dean, Sugrue significantly improved the School of Business with the M.B.A. program ranking as 14th among regional business schools by The Wall Street Journal and 58th nationally by US News and World Report; undergraduate SAT scores increased by 210 points, twice the increase for the rest of the university; and freshmen retention rose from 78% in 1992 to 92% in 2007. Sugrue currently teaches Statistics and publishes in the area of financial aid allocation models. Besides his B.S. from the Naval Academy, Sugrue earned an M.B.A. from the University of Rhode Island and a Ph.D. from the University of Massachusetts Amherst. Married to Linda Neider, their one daughter has completed her B.S. and M.S. degrees from the Massachusetts Institute of Technology, where she is currently pursuing her Ph.D. Generations of drug prevention supporters and Joe’s Stone Crab enthusiasts united to celebrate Informed Families/The Florida Family Partnership’s 31st Annual Dinner at Joe’s Stone Crab on Monday, May 16th. Following the generations theme, the illustrious event was co-chaired by generous philanthropists Nancy & Jon Batchelor and Anna & Jon Batchelor, Jr. Close to $200,000 was raised to support Informed Families’ statewide prevention programs and initiatives designed to help kids grow up safe, healthy and drug free. Over 400 guests attended the dinner, which was complete with local celebrity sightings, a pre-dinner social and of course Joe’s signature stone crabs, coleslaw, hash browns, key lime pie and legendary service. Several attendees who haven’t missed a Joe’s dinner were recognized with a special pin to commemorate their commitment to Informed Families and helping kids grow up safe, healthy and drug free. Some notable event attendees include: State Attorney Katherine Fernandez Rundle, Tammy & (Coach) Butch Davis, Jeff & Meg Wright, Dale Chapman Webb, Dorothy & Aaron Podhurst, Mary & Joel Eaton, Judge Robert Luck, Margarita & Armando Codina, Judge Norma & Eugene Lindsey, Dr. Larry Feldman, Penny Shaffer, Anita & Ron Shuffield, Ruth & Steve Marcus, Ginger Mead, Susan & Robin Shelley, Sherri & Doug Bartel and Judge Jason Bloch. Aside from Informed Families, the big winner of the night was Steve Calderon, who won the grand raffle prize: dinner for 20 guests at Joe’s Stone Crab restaurant. Sapphire Claw Sponsors: Avison Young; Dale Carnegie Training; Tammy & Butch Davis; Ginger Mead; Podhurst Orseck, P.A. Special thanks to our long-time supporters, Baptist Health South Florida and Florida Blue. Great news! 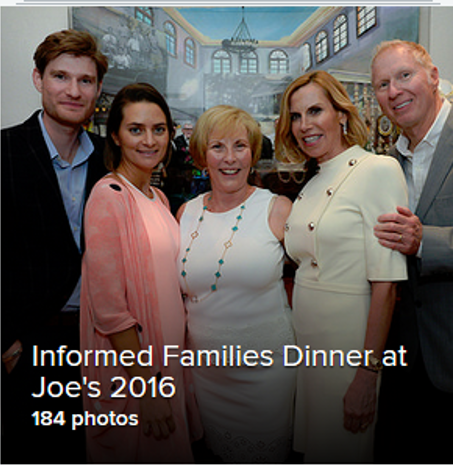 The 31st Annual Informed Families Dinner at Joe's Stone Crab Restaurant will take place on Monday, May 16, 2016. Long-time supporters Nancy & Jon Batchelor of the Batchelor Foundation will co-chair the illustrious event, alongside daughter-in-law and son Anna & Jon Batchelor, Jr. The Joe's dinner will raise funds to support Informed Families' prevention programs and initiatives across Florida, which are designed to help kids grow up safe, healthy and drug free. The theme of this year’s dinner is “Generations.” Generations of Families have been supporting Informed Families Annual Dinner at Joe’s Stone Crab for 31 years. Informed Families will be releasing wonderful photos of generations of families who have supported Informed Families’ mission of helping kids grow up safe, healthy and drug free by attending the dinner. Who can resist sharing a dinner of Joe's Stone Crabs with family and friends? The annual Informed Families Dinner at Joe’s is an event with NO boring speeches; just good friends and families who want to help kids grow up safe, healthy and drug free! “Each Generation has a responsibility to pass on the drug free message to the next Generation,” said President & CEO Peggy B. Sapp. The Informed Families dinner at Joe’s brings out Miami’s best families. Will you be part of the festivities? For more information, please contact Esther Davila Edavila@Informedfamilies.org or 305-856-4886. Long-time supporters Nancy & Jon Batchelor of the Batchelor Foundation will co-chair the 31st Annual Informed Families Dinner at Joe's Stone Crab Restaurant alongside daughter-in-law and son Anna & Jon Batchelor, Jr. The Joe's dinner, which takes place in May (the end of stone crab season) each year, will raise funds to support Informed Families' prevention programs and initiatives across Florida, which are designed to help kids grow up safe, healthy and drug free. Nancy & Jon Batchelor, who strongly support Informed Families and its mission of helping kids grow up safe, healthy and drug free, have attended and/or sponsored the Joe's dinner for many years. This past year, the Batchelors were Royal Order of the Golden Claw sponsors of the Joe's event. 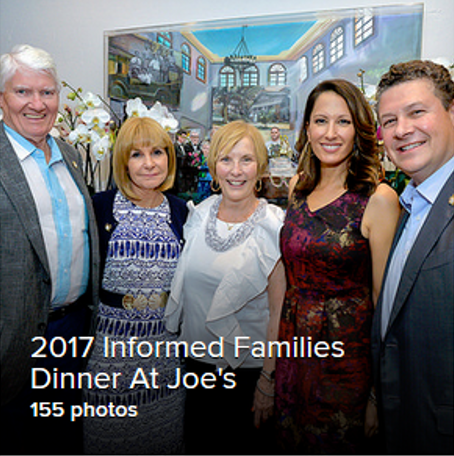 "We are delighted to have Nancy & Jon Batchelor and Anna & Jon Batchelor, Jr. co-chair our 2016 Joe's dinner," said Peggy B. Sapp, president and CEO of Informed Families. "We look forward to working with such a wonderful, philanthropic and dynamic group to plan our best Joe's event yet." For more information about the Joe's event, please contact Informed Families at edavila@informedfamilies.org. Florida Governor Rick Scott appointed Informed Families President & CEO Peggy Sapp to Florida's Statewide Drug Policy Advisory Council. "I'm honored to be selected to the Statewide Drug Policy Advisory Council," said Peggy Sapp. "I look forward to continuing to work together at the local, regional and statewide level to help kids grow up safe, healthy and drug free." In addition to her work with Informed Families, Sapp is the Volunteer President of the National Family Partnership. She has over 30 years of experience in the prevention field at the local, state and national level and has served on the Advisory Councils of the White House Office of National Drug Control Policy and the National Institute of Drug Abuse. Under Governor Jeb Bush, Peggy also served on the advisory council of the Florida Governor’s Office of Drug Control. Sapp's current term began September 18, 2015 and will end September 6, 2017. Other newly appointed members of the Council include Dorothy “Dotti” Groover-Skipper, founder of HeartDance Foundation Inc; Doug Leonardo, executive director of BayCare Behavioral Health; and Dr. John Van Delinder, executive director of the Sunshine State Association of Christian Schools.